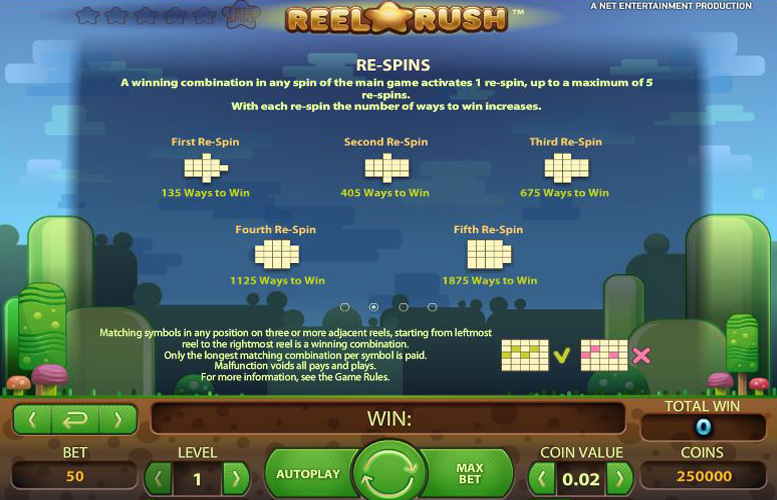 Replacing paylines with between 45 and 3125 ‘different ways to win’, Reel Rush is an innovative five reel slot game with a theoretical return to player percentage of 97.0%. Each of the game’s reels begin at different sizes but can change their configuration through exciting gameplay that features re-spins, free spins and wild substitutions to add extra interest to the slot and potentially increase the available jackpots significantly. 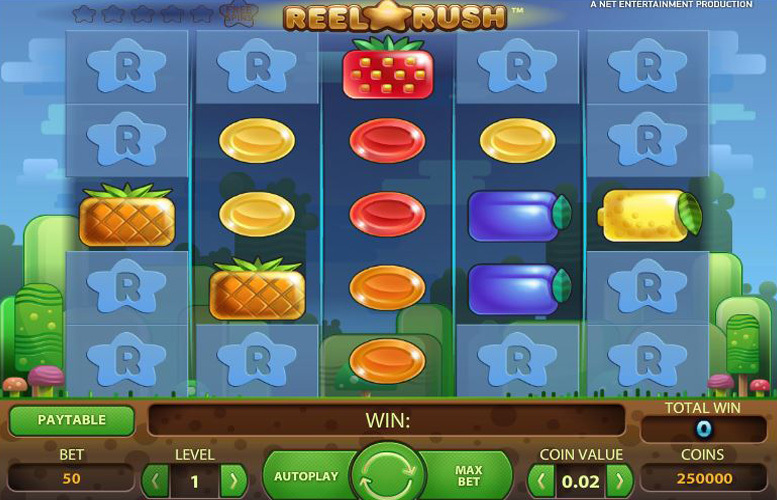 Reel Rush is not your standard slot and its gameplay differs significantly from most more familiar games on the market. That gameplay and how it relates to the slot’s special symbols and features will be explained below, along with a brief explanation of Reel Rush’s top jackpot, paytable and betting limits. Winning combinations in Reel Rush are any combinations of matching symbols on three or more consecutive adjacent reels from left to right. The value of each combination is set out in the game’s paytable and the total payout for each is determined by multiplying the combination’s value by the bet level and then by the number of the symbols appearing on each of the reels. The most valuable symbol within the game is the strawberry symbol which is worth 1000 on the paytable and the theoretical top jackpot, therefore, would result if each and every space on the reels were taken up by that symbol. In that circumstance, the jackpot achieved would be worth a total of 450,000 coins. That amount results from the aforementioned calculation of 1000 (paytable value) x 10 (bet level) x 1 x 3 x 5 x 3 x 1 (number of strawberry symbols on each reel). At the highest possible coin value of 20p, therefore, that jackpot of 450,000 coins would be worth a total of £90,000. It should be noted, however, that the game’s re-spins feature – which will be explained in detail below – could theoretically increase that top jackpot significantly, but the game does actually stipulate a maximum win of 480,000 coins. 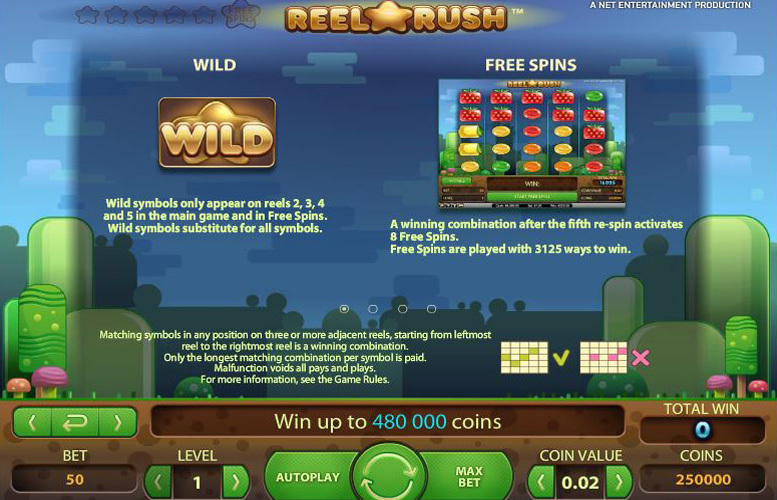 Wild Symbol – reels Rush is a really interesting and innovative game but it only actually features one special symbol. That symbol is its Wild symbol, which can appear anywhere on reels 2, 3, 4 or 5, and substitutes for all other symbols in creating winning combinations. The rest of the slot’s unique gameplay comes from its focus on changeable reel configuration and different ways to win. At the outset of the game, the setup of the reels provides players with 45 different ways to win and any winning combination which is achieved, results in a re-spin. Subsequent winning combinations continue to provide re-spins up to a maximum of five. For each of those re-spins, two additional spaces are added to the game’s reels to increase the different ways to win significantly, reaching the peak of 3125 ways for a fifth re-spin – when all reels feature five rows. Re-spins are always played at the same bet level and coin value as the spin which activates them and if a winning combination results from the fifth re-spin, eight additional free spins are triggered. The most valuable symbol according to the Reel Rush paytable is the strawberry symbol, which has a value of 1000 for a five symbol combination. That means that when at least one of these symbols appears on each reel, the player will receive a payout worth 1000 times the bet level and then multiplied by the number of strawberry symbols on each reel. If every space on the reels is taken up by strawberry symbols when bet level ten is chosen, then, that calculation works out at 1000 x 10 x 1 x 3 x 5 x 3 x 1 which equals 450,000 coins. The second most valuable symbol on the paytable is the pineapple symbol, for which a five symbol combination is worth 500. Applying the same type of calculation, therefore, the top jackpot available equals 225,000 coins if all spaces are occupied by the pineapple symbol. 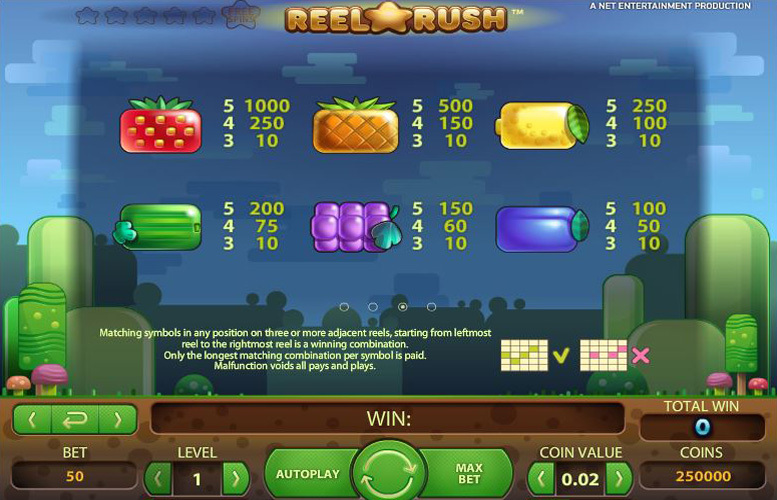 The number of ways in which a player can win through Reels Rush can alter as the game progresses but it is the players themselves who control how much they bet. They can do so by choosing between the ten different bet levels from 1-10, which are each worth 50 coins, and the five separate coin values from 1p to 20p. Those different options mean that the minimum possible stake equals just 50p when bet level one (50 coins) and a 1p coin value is chosen, and the maximum is £100 when bet level ten (500 coins) and a 20p coin value is selected. 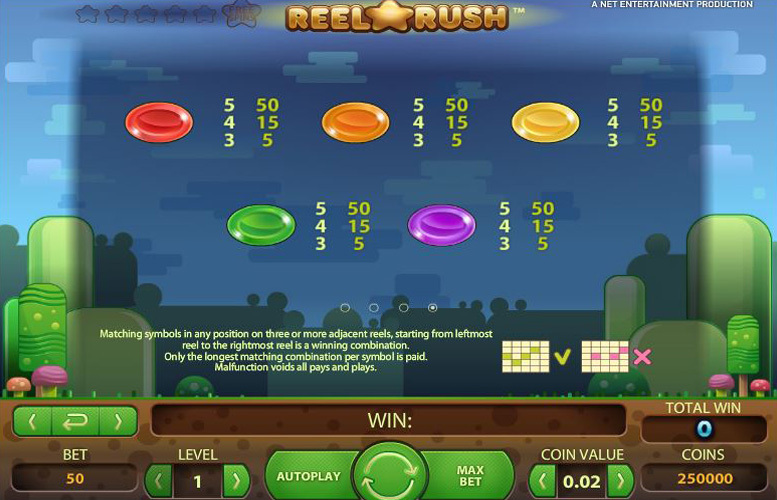 Reels Rush is a really innovative slot game that is sure to appeal to any player who is looking for something a little bit different. The game’s focus on re-spins and the re-configuration of its reels to increase the number of ways to win, makes the gameplay unique and is likely to keep a player’s interest far longer than a more simplistic game. Those re-spins too, as well as the provision of free spins and diversion from traditional paylines, can also make very generous coin jackpots accessible to players. These jackpots suffer a little in comparison with those offered by other games, however, when you consider that a cap of 480,000 coins is imposed by the game and that the maximum coin value setting is just 20p. Overall, therefore, Reels Rush is an excellent choice for any player who wants a very different and innovative slot experience, and who doesn’t mind the fact that the top payout they may receive is somewhat smaller than what they could earn elsewhere. This game has a rating of 4 / 5 with 398 total reviews by the users.